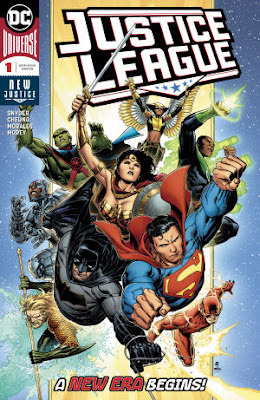 In my mind, there are three foundations to a classic Justice League tale; 1) An epic threat that requires earth’s greatest heroes to divide into smaller teams, 2) a crisis across different eras in time (if not dimensions), and 3) as an offshoot off point 2, Vandal Savage. The debut issue of writer Scott Snyder’s run on DC’s flagship team covers all three points in the first ten pages. While surprise guest stars including Kamandi and the Justice Legion show Snyder is completely rocking the step from the insular world of Gotham he wrote in Batman, to the driver’s seat of DC’s most multiversal title, one of the best aspects of this issue is actually the restorative work it does on two opposite sides of the same strategist coin - criminal mastermind, Lex Luthor and founding Leaguer (in original DC continuity), chairman, Martian Manhunter. Even Aquaman’s quip on page three, that his ability to link the team through telepathy means J’onn J’onzz can never leave, seems more a note for future editors and writers. I've wanted artist, Jim Cheung to draw DC’s big guns since he illustrated Cybermancer and Iron Man in the pages of Marvel’s Force Works. Here he proves the wait was worth it, rendering the last days of Mars, cosmic dragons and the Martian Manhunter’s analytical gaze like few before him. As battlesuit Lex strikes his first pose with a stare equally as intense, you know his recent ‘superhero’ run is over. Fully aware of the potential held by the heart of the Source Wall exploding towards earth, he is ready to use its arrival to transition into the man who will lead the earth against the all future cosmic threats. In order to become that man, he’s made his own Legion - and like everything Luthor does, their membership shows he means business. Sinestro. Grodd. Cheetah. Black Manta. Joker. The League is in trouble. “See I know what you have hidden from me and every other human on this planet. The darkest secret in the universe." A big gun Justice League. A Legion of Doom to match. Cosmic threats and the Martian Manhunter at the heart of it all. Justice League #1 restores the foundation of this title in one issue, and now the only place to build is up. Hey Dan, nice to see a new post from you. Yeah this new JL relaunch looks promising, provided they actually stick to it, and allow Synder to do his thing. Solid motivation for Luthor's turn though. I like that he's gone "evil" again, but a legit reason rather than the old stuff. Plus it feels like it's also borrowing or usual elements from Ross and Kruger's JUSTICE maxi-series, pitting the Legion against the League to once again save the world and worlds from some fore-coming doom. Hey Dale! Yup missed this so will try and get the ship back off the ground! I'm liking the new focus on the foes too - the latest issue looking into Grodd was really hot. To all those who thought Snyder could just do street-level this book must taste pretty good!